Doctors in London have used sound waves to successfully operate deep inside the brain. 1. Bypassing the body, and letting the mind interface directly with VR, for the ultimate immersive experience ? the virtual body becomes your own. 2. Via AR, augmented body parts will be able to be fitted to the body, and controlled by the brain as if you were born with them ? after a little training, without conscious thought. Internal specialised search engines whose scope is limited to just neuroprosthesis and similar devices. What is a neuroprosthetic? What types are there? What are the main differences between them? What limitations do neuroprosthetics have as we currently utilize them? The answers to basic questions such as these and more, can be found in this section. 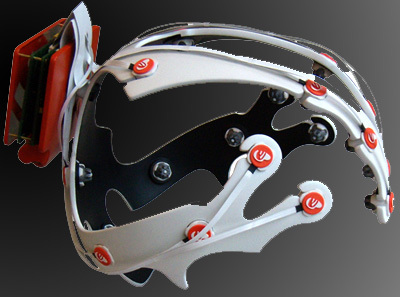 Much of the basics of neuroprosthetics are here, existing in one form or another. Why then, are they not mainstream yet? We look at the three core challenges, still to be overcome. Powering a neuroprosthetic is a tricky issue. As most of these devices are implanted either on the surface of the brain, or deep inside its folds, it is not a trivial matter to pop it out and change the battery. But, what if the same sugar that feeds the brain, could also feed the prosthetic? The two distinct types of neuroprosthetic; those that write data back into the brain, and those that take data out from it. The differing uses of each, and the hazards of combining them into an I/O interface. The neurostimulator implant envisaged by researcher John Pezaris, is not the same as the medical neurostimulators currently in use. It is one of the first true neurostimulators. That is to say, not a general pulse device, but one capable of delivering meaningful data directly into the brain. Neural readers and neurostimulators. You will never encounter two more opposing types of brain prosthesis. It is ironic then, that these two are perhaps the most frequently confused, by the lay-person. A new neuroprosthetic on the market at the end of 2009, is an attempt to actually combiine a neural activity detector and a neurostimulator into one package. Traditionally this never worked because oncethe neurostimulator activates, it blocks out all underlying brain activity in the area - the implant is only reading itself. But, what if that is the desired outcome? A new tack in neuroprosthetic interfaces is being born out of pulses of light rather than electricity. Termed 'optogenetic neuromodulation, the technique is being pioneered in the hope that it will enable a far greater level of accuracy and single-cell stimulation than is possible with electrode interfaces. Optogenetics as a field of study, is only a few years old but already a means has been found to make use of it in living brains. Light-detecting proteins combined with gene therapy and an optical neuroprosthetic with a BrainGate style 3D array allow true two-way communication between the brain and a computer system. The field of neuroprosthesis development is in constant flux, with ideas from the strange to the wacky and wild continually expunged. This section looks at many of the various attempts to enhance the usefulness and life of neuroprosthetic devices, and whether those approaches worked, or not. Following an interesting attempt at using nanotech material to 'hide' a deep brain electrode array from the auto-immune system, and allow it to interface for far, far longer. It was long suspected but never proven that attaching a neuroprosthetic to the brain, was a valid way of providing therapy, and inspiring growth in the organ. Never proven until now, that is. The ability to be able to peer in and read off a person's thoughts like you would read a book, is of keen interest to many groups, both official and otherwise. What are the implications of living in a world where we can do just that? The debut of a new type of magnetic resonance sensor for brainwaves and electrical activity - which changes the game totally for both fMRI and MEG. For the first time ever, portable, low-cost versions of both are actually a possibility. Zebrafish are handy little critters, as far as neuroscience goes. These tiny, mostly transparent little fish have brains that whilst greatly simplified, have a structure remarkably similar in basic form, to our own. Add in that aforementioned near-transparency, and it becomes possible under the correct lighting conditions, to literally see right into their brains, to the point where you can practically watch as a thought takes place. This fibre-optic pen is possibly a first for this type of augmented reality system. A dirt-cheap device designed to capture every slight pen movement of a subject drawing or writing whilst their brain is studied under fMRI. Peering into a person's brain and reading off the thoughts; detecting who is a potential troublemaker by listing their current desires, or identifying in advance who would vote for whom. The possibilities for mind reading are immense, but should we go ahead and do it at all? The ethics of peeling a sentient mind apart to satiate curiosity are complicated. Do we have any right to act on what is solely in the head of another? What are the legal implications of having an artificially enhanced brain? How does society deal with the issues that raises? An in-depth technical look at the neural-controlled weapon in Sol Bianca. How it would actually function, and the basics of how we would go about recreating it in functional form, from technology available today. A surprising find from an old anime space opera released in 1999. The main plot and most of the episodes have nothing to do with VR, but this element does. It is by far the most comprehensive and well thought out brain-machine-interface controlled firearm, we have ever come across in any genre of televised fiction. It would actually function as shown, using modern interface technology. One of the primary uses of neuroprosthetic devices is to repair damaged brain function, and beyond that, enhance what is already there. In this section are housed resources that deal with the quest to repair, manipulate, or enhance the user's recollection of events and knowledge. A proof of concept set of experiments demonstrates that with the aid of optogenetic neuroprosthetics, memory transferance between individuals is actually possible. This proof of concept also means that encoding downloadable knowledge as a set of memory engram activation patterns is at least possible. One of the primary uses of neuroprosthetic devices is to repair damaged brain function, and beyond that, enhance what is already there. In this section are housed resources that deal with the quest to repair, manipulate, or enhance the user's brain function; their ability to think and to reason. Restoring original function or expanding their mind's power to cogitate, beyond recognition. A new method of integrating electrodes and neurons into a single device, offers some tempting possibilities for new neuroprosthetics, and nerve-operated prosthetics in general. An interesting quote from the slightly obscure cyberpunk novel We can Build You, discussing details of a mood altering piano which does correspond well to what we know of the brain. Hook it up to a device which sends a different stimulation signal for every note played, and brain music takes on a whole new meaning. This single frame taken from the 2004 film 'The Stepford Wives', shows the neuroprosthetic arrays used in The Stepford Wives, to control the brains of the wives. Obviously the placement here is wrong, to do what they do. Five ECoG ? electrocorticography ? arrays could not perform the functions of mind control demonstrated in the film, because they do not penetrate deeply into it. Thus they are symbolic of the science involved, rather than prescriptive. One of the most profound uses of neuroprosthetic devices - and the drive behind most of the funding - is the repair and enhancement of natural functions and processing regions, restoring function to those who have lost it, or who never had it. A look at one of Arthur C Clarke's quotes on training the brain to understand a new sense, and comparing that to actual experimentation with deep brain prosthetics. Researchers at the University of South Florida have developed a wheelchair-mounted robotic arm, which is capable of interfacing with the wheelchair user's thoughts via a non-invasive neural interface. Industry news, originally posted 14-11-2004. The world?s first hippocampus prosthesis has passed the first stages of live testing. A second part to Wired's article "Rewiring the Brain: Inside the New Science of Neuroengineering", continuing on along the same lines; looking at the work of Dr. Ed Boyden, and his prototype Transcranial Magnetic Stimulation machine. Industry news, originally posted 09-07-2004.. In a major breakthrough for wetware <=> hardware interfaces, particularly those of virtual, and prosthetic limbs, some of the signals from abstract brain cells have been accurately decoded. Neuroprosthetics, brain emulation and mind uploading are together perhaps the most extreme end of the trend towards virtual reality. All three are BMI, or Brain-Machine Interface. BMI is an old field, stretching back over six decades, concerned with direct-connecting the human brain to machines, in order to improve the function of both. A wired article about Dr Ed Boyden and his lab, at the cutting edge of applied neuroscience. A fairly lengthy and in depth article on the process of reverse engineering and enhancing the brain, and showcasing the state of development of the science as of early 2009. Carbon nanotubes are perhaps not the first thing that spring to mind when you think of neuroprosthetics. Rather, electrode arrays spring into the mind's eye. Yet, nanotube scaffolds are definitely advancing, as brain interfaces in their own right, both to repair brain function, and to augment it. SimStim, or Simulated Stimulation is the long fantasied ability to feed simulated sensory data into the brain. Either completely artificial data, or the sensory inputs of another mind. Is it still in the realm of fantasy? Of all aspects of repairing or augmenting the central nervous system, the spinal cord gives the most grief. This bundle of nerves cascading down the body, is our only link between mind and muscles, between our heads and our bodies. Sever it, and all communication is lost. Being able to repair it, or interface directly and override it, would be a disruptive breakthrough like no other. A news story from April 2008. An engineered material that can be injected in fluid form into damaged spinal cords could help prevent scars and encourage damaged nerve fibres to regrow along a scaffold it provides as it solidifies. Discussion of a possible hardware-based neuroprosthetic interface method designed to maximise speed gain in body-machine sensory interfaces. A basic overview of the spinal cord, and the reasons why it is such a problem to repair, or interface a prosthetic onto. Prosthetics that interface to the peripheral nervous system - the network of nerves that lay below the brainstem - are a special case. Technically they are not neuroprosthetics in the classical sense, however they do use many of the same methods to integrate into the body's sensory network. NeuroPhone is exactly what it sounds like - a neuroprosthetic mobile phone. Developed by Tanzeem Choudhury, Rajeev Raizada and Andrew Campbell of Dartmouth College, New Hampshire, the phone makes use of an EEG helmet and the P300 response to make phone calls. 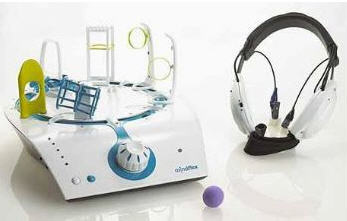 Debuted at CES 2009, mind flex is a Mattel thought controlled child's toy. 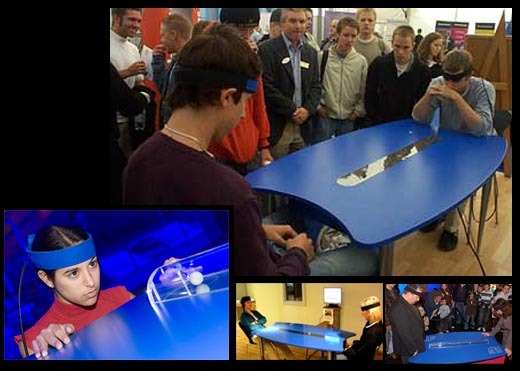 Brainwaves are read to spin a fan faster or slower, to allow a ping-pong ball to navigate an obstacle course. Mindball is something of a novelty game. It has one main claim to fame: That it is operated by thought alone. It is a fairly primitive first generation brain-computer interfaces game that just so happens to take up a lot of room. Technological telepathy, direct brain to brain thought communication via the Internet is just beginning to be a reality. This section explores and questions development in that space. The Animatrix short film 'World Record' serves as inspiration, and perhaps an object lesson in the powers of the mind over VR, once you are certain it is VR. Here we see a control room deep in a bunker complex. On one of the screens in front of the operator, a live video feed has just opened. What is perhaps unusual about the feed, is it is coming directly from someone's brain. A small monkey in a bio-jar, next to the woman it thinks of as its friend, family, loved one, has just noticed two decidedly unfriendly shapes surfacing out in the ocean, presumably having walked along the sea floor. Its eyes have focussed on them, and its brain processed the images. Is there a danger as brain-computer interfaces become more and more complex, interacting with systems in ever more convoluted and intricate ways, that we could indeed open up our worlds to subconscious hacking? One for the mid term future, this. The diagrammatic representation for easy understanding, of how dendrites and axons in the nervous system might be attached to a a remote body via the Internet. Pressure build-up inside the cranium, is one of the most dangerous physical conditions to threaten the brain. In some individuals, fluid build-up is so intense that it risks crushing the brain. Until now, the only way to detect it, has been to drill a hole into the skull, and insert a sensor cabled to a diagnostic machine - for weeks at a time. In the video below, tunes are played via neuroprosthetics. What you are hearing, sounding eirie and mournful, is quite literally the sound of a healthy human brain working. Different areas were assigned to different notes, and the volume determined by the amount of activity. Areas with very low activity were filtered out entirely. Whilst it is certainly true that neuroprosthetics do not have to be limited to simply thought interface devices, by and large, they have been. The other side of neuroprosthetics, have been ignored. That other side being a system implanted into the brain, in order to not interface with the mind, but continuously monitor the health of the brain. 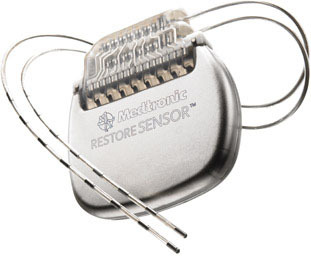 The twin companies of Medtronics and Neuropace have managed to develop the first neurostimulators that monitor electrical activity via electrodes implanted deep in the brain in a remarkably similar approach to neural-readers. They could be used for brain-machine interfacing, true, but in this case the deep electrode arrays are intended to monitor fluctuations in the electrical potential in at-risk areas of the brain. It is not a pleasant subject to consider, but as neuroprosthesis and brain machine interfaces grow in both sophistication and common usage, it is a subject we will have to give more thought to. When a brain is connected to a larger system, alter the input it receives from that system and you directly alter the output. Here we have a remote control, used to control what was originally a human, now just a glorified appliance. If the idea of a remote being used to control a human seems preposterous, remember GVS. Here at VirtualWorldlets, we are always keen to bring you news of the latest improvements in neuroprosthetics, but just to be fair, it seemed only right to also show you some of the work of the other side of the coin. This podcast consists of a mash-up of speeches, film clips and documentary segments, from an author trying to educate as to how brain implants are utterly evil. The Stepford Wives is part black comedy, part science fiction ? or should that be science fact? 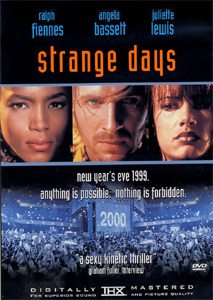 It is vaguely a remake of a 1975 film of the same name, which was itself a novel adaptation. However, the 2004 film goes into significantly darker, and disturbingly realistic technological detail. Brain <--> Computer direct neural interfaces. Theory of objects states that 'the best all-around explanation for the occurrence of sensations is the existence of a world of external things'. Thereby, as simulators become more sensory, they become an actual reality. "Virtual presence is indistinguishable from real presence." A look into the future of the neuralprosthetic and what utilising such will eventually mean for our definition of 'virtual' and 'real'. It has become apparent that whilst research into Brain Machine Interfaces continues at a steady pace, there is a certain amount of confusion in both academic and commercial circles about just what comprises a brain-machine interface. This disambiguation article intends to clarify. A book quote from Arthur C Clarke's Profiles of the Future on an 'electric sleep apparatus' piqued our interest, and we can verify the devices do exist, along with some our our thoughts on application of the technology in VR. One of the (hopefully) characteristic human gestures of the not so distant future. 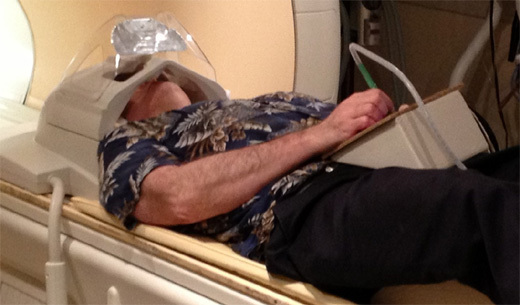 Diffusion spectrum imaging is a new technique at time of writing, which allows magnetic resonance brain imaging, at a much higher level of fidelity than fMRI permits. fMRI or functional magnetic resonance imaging, is one of the newest brain imaging technologies for the first decade of the 21st century. It is a basic form of Brain-Computer Interaction. An early 2007 study by John-Dylan Haynes at the Max Planck Institute for Human Cognitive and Brain Sciences in Leipzig, Germany, demonstrated the possibility to read an individual?s intentions before they act by monitoring the activity in their brain. The brain is of profound importance. It is the place that houses our sense of self, our mind. It contains all of who and what we are. As technologies advance, Brain-Machine interfaces will become more and more sophisticated, and our understanding of the brain's functions will become ever-greater. This resource is a search engine specifically geared to finding all resources on the site that deal with developments / prosthetics for different brain regions. An ABC news broadcast soundbite concerning the BrainGate was released in early 2007. 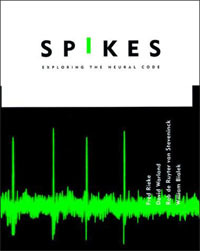 This forms the basis of a simple introduction bot to the system, and to the shortcomings of invasive brain interfaces. Brainstorm is essentially a film along the lines of SimStim, or Simulated Stimulation. It came along in 1983, long before virtual reality was a mainstream concept for the first time. It is nowhere near the level of colourful fluff that covers blockbuster VR films like ?the Matrix?, but, at the same time it more than holds its own. Brainstorm doesn?t deal with virtual reality par se, but rather with a similar technology, that of SimStim. It doesn?t refer to it as SimStim, which was coined in the earlier William Gibson novel ?Neuromancer?, but that is exactly what it is. Using a sensory jack to record one person?s senses and emotions, then playing them back to another person, as a wholesale experience. Industry news, originally posted 10-02-2005. Researchers from the New York State Department Of Health and MIT show it is possible to use brainwaves picked up by electrodes attached to the outside of the scalp to move a cursor around a computer screen. CBS News have produced a 12 minute segment of their '60 minutes' documentary, which takes a look in depth at the development of BrainGate and other direct-implantation Brain-Computer Interfaces, or BMI. Electrocorticography or ECoG is a method of neural interface in which an electrode array, quite like a fine mesh, is draped over the upper surface of the brain directly, under the skull. A section of the skull is removed to allow the array to be fed in, then replaced. The result is near-identical to a high fidelity EEG that is under the skull and thus away from its pattern dampening properties. Adapted from a lecture given by Marshall Brain at the 2nd Annual Workshop on Geoethical Nanotechnology, this resource looks at the concept of mind uploading - transferring a conscious mind into a computer - and tries to use common metaphors to explain the subject to the layperson. In 2008, Caltech researchers are working on developing a MEMS-based (Micro-Electro-Mechanical System) brain-computer interface, with initial designs proving promising, and holding the potential to overcome the signal degradation problem. ECoG, or electrocorticography is a method of brain-computer interaction, in which a mesh of electrodes is placed like a veil, directly over the outside of the brain itself. MicroEcog, as the name suggests, is an order of magnitude smaller, and much more permanent. A look at a different type of Brain Machine Interface: The emerging field of animats, or robots controlled by neural tissue that grows and multiplies between electrode arrays. An informative article from late 2008 by The McGill Daily, examining the hurdles in using BMI (Brain Machine Interfaces) to control prosthetic body parts. Industry news, originally posted 17-01-2005. This resource is little but a brief scribble, yet its points on the state of neuralprosthetics represent a milestone in their development. At The Entertainment Gathering on December 12th 2008, Tan Le, co-founder and president of Emotiv Systems, gave a live demo of EPOC, her non-invasive brain machine interface system. A history in chronological order of important events in the development of the BrainGate chip by CyberKinetics. This primative Neuralprosthetic kick-started the field by delivering concrete, repeatable results for the first time. Industry news, originally posted 10-04-2005. A patent granted to Sony Entertainment for a device for transmitting sensory data directly into the human brain, may sound exciting, but will likely lead to stifled growth for neuroprosthetics. A comprehensive introduction to BMI for the unacquainted. This article attempts to delve into greater depth on one of the more fascinating and likely to happen aspects of the film "The Thirteenth Floor" - the ability to upload your mind into a virtual environment indefinitely. IMEC, a nanotechnology company out of Leuven, Belgium, has developed a new approach to neuroprosthetics, an electrode probe that is capable of two-way data transfer. It can read neighbouring electrical impulses, and at the same time, transmit new impulses back. In order to link a mind to a virtual body, which will be controlled by the same subconscious and conscious impulses as a physical body should be, the link connecting the mind to the physical body, save for autonomous finctions, is likely to require severing or blocking for the duration of the virtual immersion. Emotiv Systems? EPOC, is a brain-machine interface intended for the commercial gaming market. The intent is to allow gamers and by extension those in social virtual worlds, to control their actions within the game/environment with their thoughts, expressions and emotions. Neuroprosthetics couple to the nervous system. However, whilst it makes sense for the majority to couple to the upper brainstem or brain directly, they do not have to. There is a whole body full of nerves, to integate to. Modern limb prosthetics are quite amazing. The sudden need for large quantities of replacement limbs, born out of recent, bizarre wars such as the US-Iraq mess, has kick-started the prosthetic industry. Only problem is, they are not cheap to make. Optogenetics is a novel field. Half brain interface, half genetic engineering. None the less, it is starting to make inroads as a means of non invasive writing back to the brain. An introduction to a new type of brain-machine interface, the subskull brain blanket. Ex-Marine Claudia Mitchell lost her arm in a motorcycle accident two years ago. Since then, she struggled with life with one arm. Standard prosthetic limbs gave a cosmetic limb, but added nothing to her quality of life. Now, she is the first human trial of a bionic arm, developed at the Rehabilitation Institute of Chicago. In research made public in the first quarter of 2009, a French surgical team consisting of Angela Sirigu and colleagues at the Institute for Cognitive Science in Lyon, France, made a stunning discovery with regards to transplanted hands: Under proper stimulation conditions, the nerves grow back, and the hands begin to function normally. A story about the state of tech at the end of 2006. Neuroprosthetic devices had some concrete success stories in the past few years, and the stage was finally set for developing them, not to just monitor and interact with brain signals, but control external body parts as well. In neuroprosthetics, rather than guide the electrodes to neuron dendrites, why not guide neuron dendrites to the electrodes? This shows what is essentially a full sensory immersion LAN. An eight person, totally self contained full-immersion VR machine. As shown, the interface method is direct neural biofeedback; the staple for the Matrix universe. Each of the person's brains are connected to the system via their brainstem, allowing full two way bodily sensory stimulus. However, there is no connection to the greater internet. Industry news, originally posted 16-05-2005. Rather than simply manipulating a robotic device, an organic brain incorporates a robotic limb as though it was born with it attached. A look at the fundamental problems plaguing the development of neuroprosthetic devices. A Sky News soundbite, examining the work of University of Pittsburg researchers on prosthetic limb control, which nicely sums up the state of development for prosthetics in the closing months of 2009. Neuroprosthetics along with less invasive brain machine interfaces have really gone from strength to strength over the past decade. However, all of them are still detecting or modifying signals that are electrical in nature, whilst the brain itself is electrochemical. Now, from a rather unlikely source, comes the first evidence that a chemical detector and tracker is actually possible inside a complex multicellular structure. Star Trek: The Original Series, & VR ~ Operation -- Annihilate! A look at Star-Trek inspired improvements to brain machine interfaces, very very realistic and plausable brain machine interfaces. Networked neuroprosthetics used to control and subjugate a host population. Not the most original of storylines, but the first time such appeared on TV. At this time, it was original, and done well indeed. Japanese researchers have created the very first, incredibly crude, neural-jack interface, a distant ancestor of those seen in cyberpunk and the Matrix films, but of the same lineage all the same. An unexpected discovery of a hierarchical networking scaffold inside the human brain itself, has interesting implications for future neuroprosthetics. Rather than having to interface with the grey matter right where computations are being done, we may in fact only have to interface with the white matter 'between departments' as it were, to achieve the same interface effect.